Faucet and drain are included. A Contemporary vanity by Bosconi has a top ranging from dark granite to Carrara marble. This brings out the highest of quality that is the standard for Bosconi. Carrara or "luni marble," as the Romans called it, is carved from the Apuan Alps. The under-mounted ceramic basin sinks create just the right contemporary look. 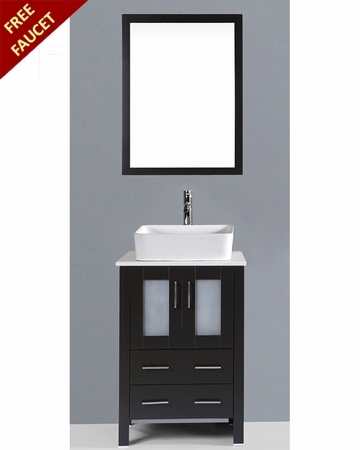 Also, the colors of finished Contemporary Bosconi vanities vary from white to black. Solid wood frames with a CARB PH2 certified panels with soft closing hinges assure you of only the best quality. The feel of the soft closing hinge can be experienced when the door is pushed to close, and the hinge decelerates the closing action. And, all our Contemporary Collection bathroom vanities at Bosconi come with mirrors, but without faucets and drains to give you only the greatest options of choice. Form meets function with this classic 24" espresso Bosconi vanity. The simple modern lines are accentuated by the ceramic, rectangular vessel sink and vertically mounted vanity mirror. Versatile features include a single cabinet with soft closing doors, spacious enough to store towels, toiletries and accessories. Dimensions: W24" x D18" x H38.5"
Weight of Vanity: 100 lbs. Dimensions with Packaging: W25" x L20" x H43"
Weight of Vanity with Packaging: 114 lbs. Solid Oak wood frame, CARB PH2 Certified plywood sides and paneling. Four soft closing cabinet doors, four drawers. Phoenix Stone countertop: 0.7" thick. Dimensions: W19" x L14.5" x D5"
Single white rectangle ceramic vessel sink. Mirror Dimensions: W24" x H31.5"
Weight of Mirror: 13 lbs. Weight of Mirror with packaging: 14 lbs. Which shall it be? Contemporary or Classic? You will be delighted with your choice when it is a Bosconi vanity. Our standards are at the highest end of the spectrum. And, our stock is always kept up to date ensuring you will always find fresh ideas. 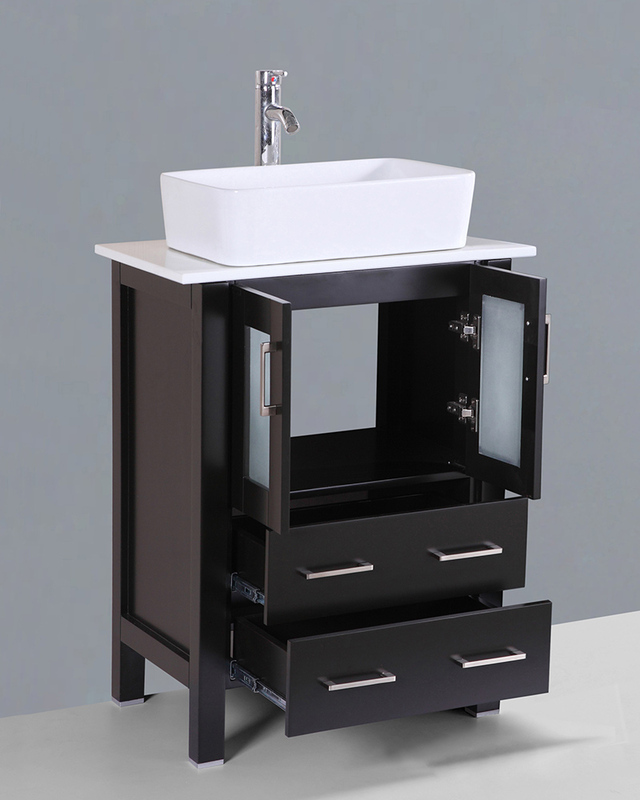 Your bathroom vanity is viewed and experienced by every member of the household throughout the day, and night. From the start of the day to the latest hours of the night, your vanity stands ready to meet your needs. At Bosconi we concentrate on bringing you the very best in bathroom vanities. With a Bosconi vanity in your home or office, you can know that you have chosen from the best available furnishings for your bathroom. Will it be a Contemporary or Classic? Only your most selective palate can decide! At Bosconi, you cannot make a mistake because of the range of vanity options we provide to you. With a vanity by Bosconi, you will be sure to make the right choice.